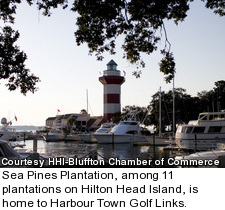 Hilton Head Island in South Carolina is not just another master-planned resort community. It was the nation's first. After General Joseph Fraser bought most of the empty island -- 19,000 of its 25,000 acres -- his son Charles imagined a new kind of residential development co-existing with nature. This was cutting edge. If Hilton Head Island were being done today it would be lauded as "green" and rolling in LEED certifications. Strict covenants were enacted to preserve as much of the island in a natural state as possible, and these have been maintained to this day in all 11 communities, known as "plantations." Examples include a prohibition on white houses because they would stand out. No neon signs are allowed, or streetlights, which would interfere with the night sky. No homes can be built between the dunes and ocean. Besides preservation, Charles' innovation was the previously unknown "master plan," where one developer controls every major aspect of the community, from road layouts to home designs. It began with Sea Pines Plantation, the island's first development and its largest today. 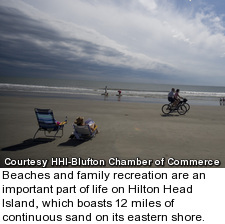 Hilton Head Island is 12 miles long and 5 miles wide, and its main appeals are sports, recreation and the ocean. 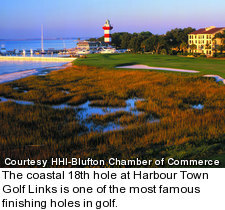 There are more than two-dozen golf courses -- headlined by PGA Tour venue Harbour Town Golf Links -- as well as five major tennis centers, nature preserves and continuous beach spanning 12 miles of the East Coast. Fishing, sailing and water sports are huge here. An extensive network of biking and walking paths crisscross the island, and there are more than 250 restaurants serving a year-round population of less than 40,000. It's very self contained. As of May 2011, there were 878 condos and 795 homes for sale, with median prices of $309,450 and $749,000, respectively. Oceanfront and ocean view homes command a substantial premium, with a median price of nearly $1.4 million. Two-bedroom condos around the island range from $219,000-$450,000, while an entry-level, three-bedroom home begins at $365,000 (in Palmetto Hall). At the other end of the scale, a six-bedroom luxury oceanfront home in Sea Pines Plantation is on the market for $9 million. Prices and selection vary widely all around the island. Some of the plantations do not allow homes or condos to be rented short term, while other enjoy very high-rental rates. There are also 329 available lots for new construction, with a median price just more than $250,000. Sea Pines Plantation: Spread out over 5,000 acres, it's home to four golf courses, including Harbour Town, as well as hotels and shops. There's a broad range of housing options, from condos with high-rental occupancy to "Gold Coast" mansions, including the home of Home Depot founder Arthur Blank. Shipyard Plantation: There are more rentals than residential homes here. It caters to second homeowners looking to use the property a bit and generating income when they're not using it. Shipyard Plantation is home to the Crowne Plaza Resort. Wexford Plantation: It's gated, big and very high-end, with its own marina and elaborate canal and lock system, allowing for "backyard" boat docks. Entry-level townhomes here start at $700,000. Long Cove Club: The island's most serious private golf community, Pete Dye's Long Cove Club is an even more desirable tee time than Harbour Town. Long Cove is consistently ranked as the best course on the island -- and often in all of South Carolina. It's high-end, but not as pricey as next-door Wexford Plantation. Leamington: This is the least well-known plantation in Hilton Head Island. It's small, upscale and gated, and no rentals are allowed. Palmetto Dunes: Embracing the oceanfront, this community has some of the island's largest oceanfront homes. In addition to three semi-private golf courses, it has one of the nation's most highly ranked tennis facilities as well as Marriott and Hilton hotels. Port Royal: It's quiet and a bit off the beaten path. Port Royal is purely residential, with a private beach club, oceanfront pool and semi-private golf course. Palmetto Hall: Considered the "newer" golf community, it attracts year-round, full-time residents, including young families and retirees. Short-term vacation rentals are almost non-existent here. 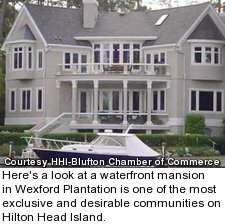 Hilton Head Plantation: The second-largest plantation, this one is aimed at families but has a mix of singles and retirees. 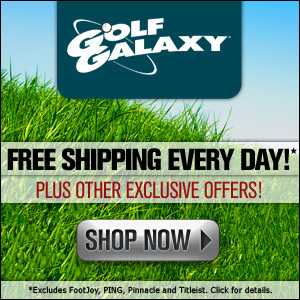 Three golf courses, plus exclusive Ribaut Island, are within the gates. Waterfront homes start at $1 million. Indigo Run: Across the street from Hilton Head Plantation, Indigo Run is among the newest developments. It's gated, with a broad range of homes starting at around $500,000. There's one golf course, The Golf Club at Indigo Run. Indigo Run is completely residential. There are no short-term rentals. Spanish Wells: This plantation is old money. It's exclusive, but not gated. Spanish Wells is home to multi-generational islanders and some of the most beautiful waterfront homes, due to the only peninsula on Hilton Head Island allowing for waterfront views from your front door and back deck. Deep-water docks are available.